Coming at you this month is just about the fanciest (and priciest) food I do believe Miss Bebe and Jolie have ever had their pawsitively prissy palettes exposed to. Imagine a grain free salmon and turkey blend with strawberries, that's freeze-dried and raw? This item describes itself as raw and prey-inspired nutrition.The Nulo Freestyle Grain-Free Salmon & Turkey Recipe With Strawberries Freeze-Dried Raw Dog Food is at first glance packed with a whopping containing 83% salmon and turkey, organs and bone plus dried egg yolks, broccoli and kale. I really didn't think my dogs were going to like this as they are notoriously fussy eaters. Also in the food is a probiotic that I've never heard of called GanedenBC30. It claims to that supports your dog's digestive and immune health with every bite. In addition, it is made with no corn, wheat, soy, artificial preservatives, colors or flavorings, which really doesn't come as a surprise given the price point and other features of this fancy food. 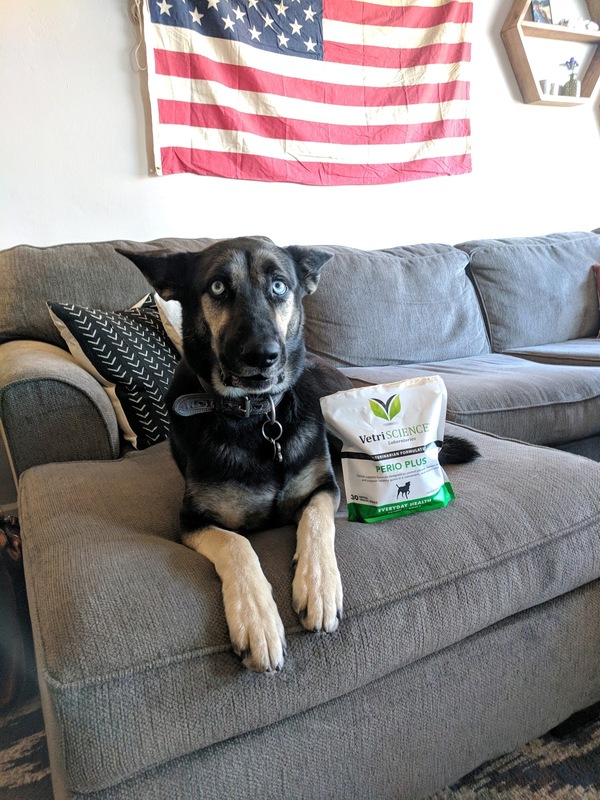 My dogs did enjoy this food but I was shocked to notice how small the bag was. It was only 13 ounces, which isn't even a pound of food. I'm not one to be cheap with my dogs, and if you've followed me for a long time you know just exactly how much money I spend on them. However, to spend $34 on 13 ounces of food seems ludicrous to me. I don't see how anyone could afford that. My dogs are tiny and this bag of food didn't even last them the whole week, meaning that realistically I would need to spend around $200 a month on food for them both. I cannot even imagine what it would cost you if your dog weighed more than 5lbs. The benefits are clearly there, but they also exist in much more cost efficient brands such as Solid Gold and Blue Buffalo, two of our absolutely most favorite brands. The food itself looks like puffy Cheetos and most of the bag is crumbs and dust, which I didn't mind too terribly since my dogs are missing most of their teeth and just licked it up. I am glad that my dogs got to enjoy this incredibly posh food for a few days, however, at the price point, I couldn't recommend it. I received these goodies free of charge from Chewy.com in an exchange for my honest review. Coming to you this month is another product by a newly discovered brand for us. That brand is called VetriScience. A couple of months ago, we ordered the powder which I was super skeptical of. You see when you have two senior dogs, who are missing several teeth, and your bank account is missing several thousands of dollars due to the anesthesia teeth cleaning, you could understand why. I had a very positive experience with the powder and a little really has proven to go a long way. My dogs' breath smells a little less foul and the plaque and decay have significantly decreased. We still have about 3/4 of the product left so I'm excited to see the results once we finish the product. 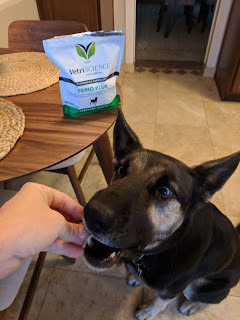 Since I had such a good experience with the powder I was excited to see that Chewy offered up the VetriScience Perio Plus Everyday Health Dental Stix Dog Treats for review. These treats were unfortunately too big for my little Yorkies, but luckily we have a special furfriend who we gifted these yummy stix to! Layla has been on the blog before and she is a gorgeous mix of 1/2 German Shepherd and 1/2 Husky. 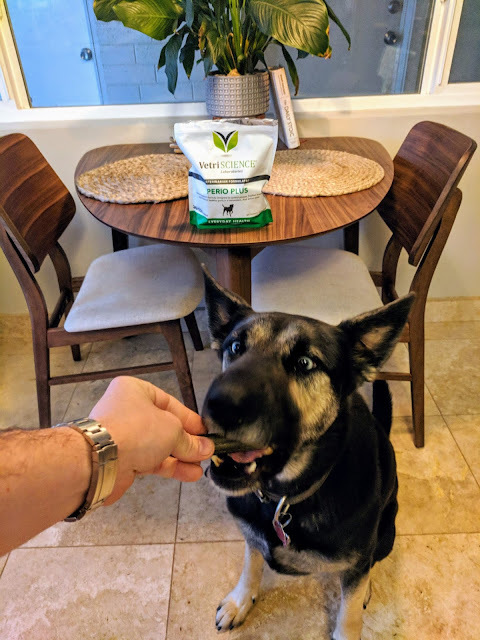 She's still a puppy and so I was thrilled to be able to gift her these treats. One because the company's powder really is helping my senior toothless dogs and two because prevention is key! Layla's owner Daniel, expressed that she really enjoyed the sticks and treated them as treats! Woot, woot! Don't you love a good pun? This product is available for cats and dogs and also in a powder form. The key benefits of this treat is that the outside layer of it are made up of natural ingredients like Champignon Mushroom Extract, cinnamon and parsley which aide and promote dental cleansing, plaque, and tartar control. The inside of the treat is also working to support your pups oral health with solid sources taurine, natural zeolites and cranberry! Also included in this treat is CoEnzyme Q 10 which is a beneficial and vital supplement for your pet's heart health. As your dog ages this enzyme decrease so it's important to supplement them before they age. Think of taking calcium throughout your adult life in order to prevent osteoporosis as a senior adult! Layla loves her gifted treats and Dad reports fresher kisses. I'm always amazed to see dog food companies offer up fish options. It's not only for cats you know? Fish in a dogs diet provides many benefits including being extremely high in protein and omega-3s. 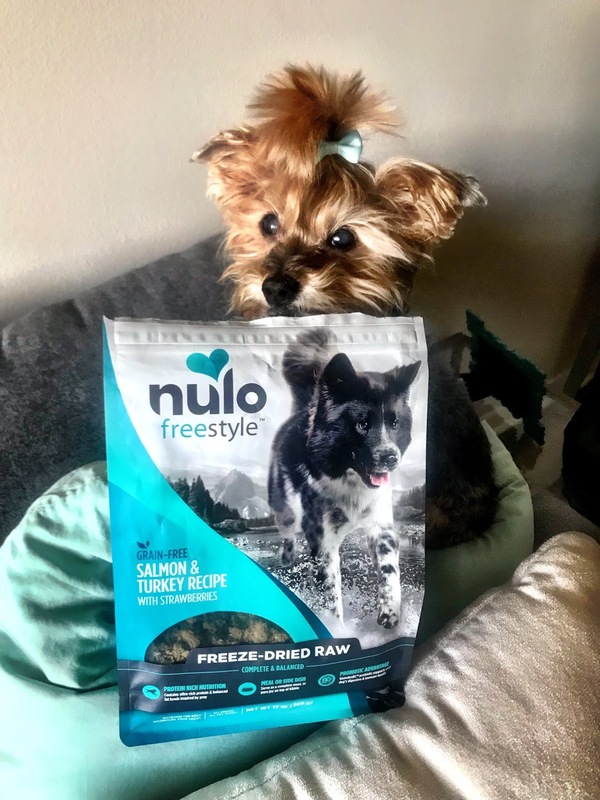 For the most part, fish is high in protein but a dog cannot get all of their nutritional needs through fish alone, which I was delighted when I saw that Halo came out with a blend of Salmon and Venison wet dog food. Salmon has many benefits in a dogs diet. It is a fatty fish which is also a good source of omega- 3 fatty acids. These fats support the immune system and can be beneficial for skin and coat health. There has also been some indication that they may benefit dogs with allergies. While venison, or deer meat, has less protein than beef, it also contains less fat and cholesterol, making it an increasingly popular meat source in commercial dog foods. Venison is a good source of B vitamins and minerals such as zinc, phosphorous, and iron. It helps dogs maintain healthy energy levels and many dogs enjoy the taste. This pet food is jam-packed with nutrients and is contains non-GMO fruits and vegetables. I am at ease feeding them this because I know that they are getting a balanced nutritious meal, and they think of it as a treat. Normally I feed my dogs dry kibble, but I do entice their taste buds with wet dog food from time to time. My dogs love this stuff so much they actually start doing tricks once I peel back the top of the can. That makes us all happy! I'm also delighted in knowing that the recipe is specially formulated for smaller sized breeds for a healthy weight point calorically. Since my dogs are seniors now and have had pancreatitis scares, I do monitor what they eat quite often. This, once again, gives me peace of mind. Another key benefit from this food is that the texture provides additional hydration which is important when your pups live in Arizona. 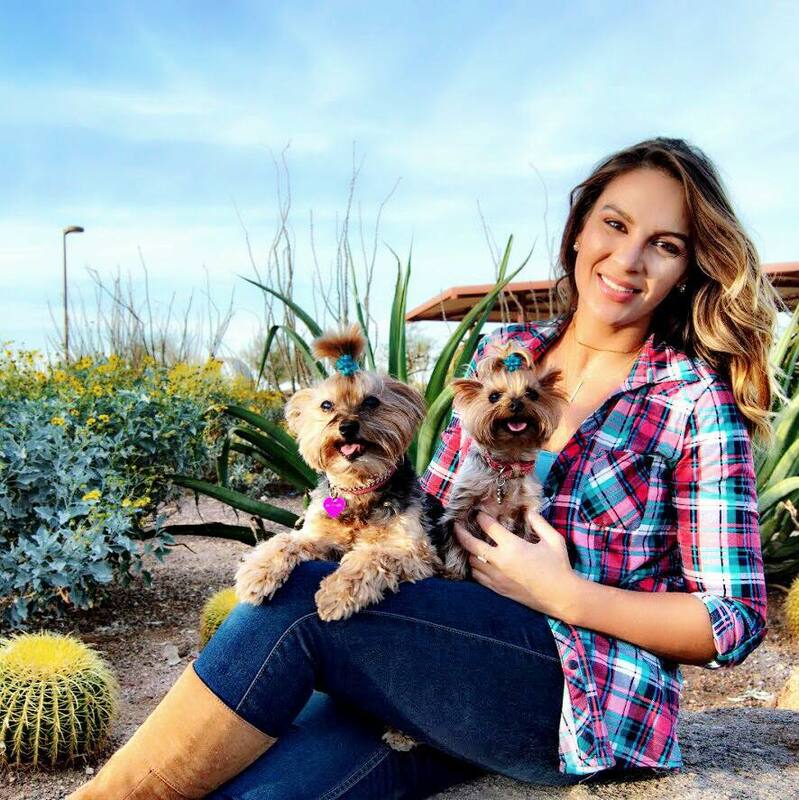 Sometimes my girls won't drink a lot of their water, but they are always hungry, so I add water or supplement wet dog food to make sure they stay hydrated. Yes, I sometimes spoon feed my dogs their meals with a pink spoon. Are you surprised?